SBI! for WP plugin is a fantastic tool for web entrepreneurs and small business owners alike. I am voluntarily offering my opinions by reviewing SBI! for WP without compensation. As an internet business consultant, I felt this would be the perfect product to review for myself and for my local clients. SBI! for WP is a unique plugin to assist anyone who desires to succeed online. I was excited to see all the written resources, well within my reach. This plugin also includes a local business series, that can help users gain a competitive edge over their competition. SBI! for WP is affordable and is a must have, if you're serious about your online business idea! I feel that SBI! for WP is for anyone looking to start or grow a successful business online. I mentioned that this product included a local business series, which I was very interested in exploring. The series provided helpful information about how small businesses can grow their local customer base using the internet effectively. I've found that local search is a very important aspect of any small business. I'm a local small business owner, so I was thrilled this series was a resource included with this plugin. I really liked the 10 day Action Guide and how it was broken down section by section for a nice viewing experience. This makes it easy to toggle back and forth when I need to go back and review various sections of the guide. I really wish there was a video form of the Solo Build It! 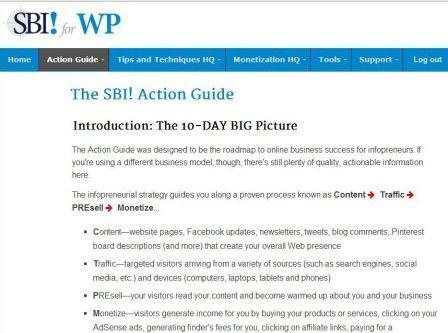 for WP Action Guide. It would really be great to be able to listen to the guide in addition to being able to read it. I sincerely believe Solo Build It! 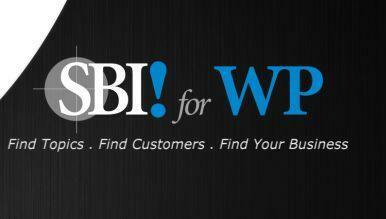 for WP is a fantastic tool for bloggers, web entrepreneurs and small business owners around the world. It's an affordable and thorough product, fully equipped to help its users truly succeed online.